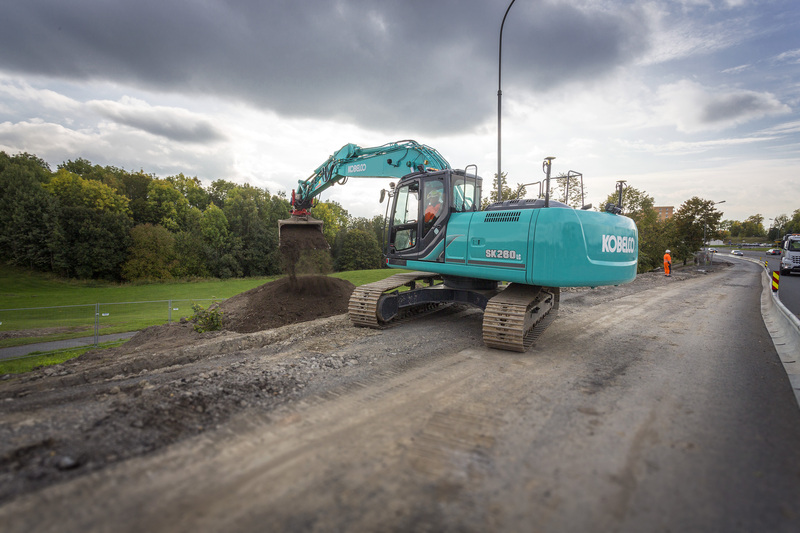 Next Generation – Power meets Efficiency - Kobelco Construction Machinery Europe B.V.
For more than 30 years, Kobelco has been committed to developing its SK range of excavators. It is this dedication of time, investment and resource that has enabled the construction manufacturer to launch its latest Generation 10 range of specialist construction and earthmoving machines. These latest models, which are among the first to comply with Stage IV of the exhaust emissions regulations, lead the way in class due to increased productivity, increased fuel efficiency and increased durability, contributing to an overall reduction in operating costs. The Kobelco SK210LC-10/SK210NLC-10; SK260LC-10/SK260NLC-10 and now the new SK350LC-10 and SK350NLC-10 are borne from more than three decades of excavator manufacture coupled with modern technology and customer feedback. Whether operating in a mine, quarry, forest or on a busy urban job site, increased power and greater fuel economy when compared with previous Generation 9 models results in higher overall efficiency on any project. For example, the SK260LC-10 offers an impressive 9% reduction in fuel consumption in Eco-mode, while the SK210LC-10 reduces fuel consumption by 6.1%. These efficiency improvements are further enhanced by respective 5% and 6.7% increases in productivity while operating in H-mode (Heavy Mode) at the same fuel consumption. In addition, the Generation 10 models’ improved shovel load coupled with dynamic digging force helps contribute to a class-leading 7% greater digging volume when compared to previous models in class. Generation 10 machines are powered by powerful Hino engines, which incorporate DOC (Diesel Oxidation Catalyst) and the combination of DPF (Diesel Particulate Filter) and SCR (Selective Catalyst Reduction) for the ultimate in ‘clean technology’. Together, these systems reduce the amount of DEF/AdBlue fluid consumption used in the post-exhaust gas system. 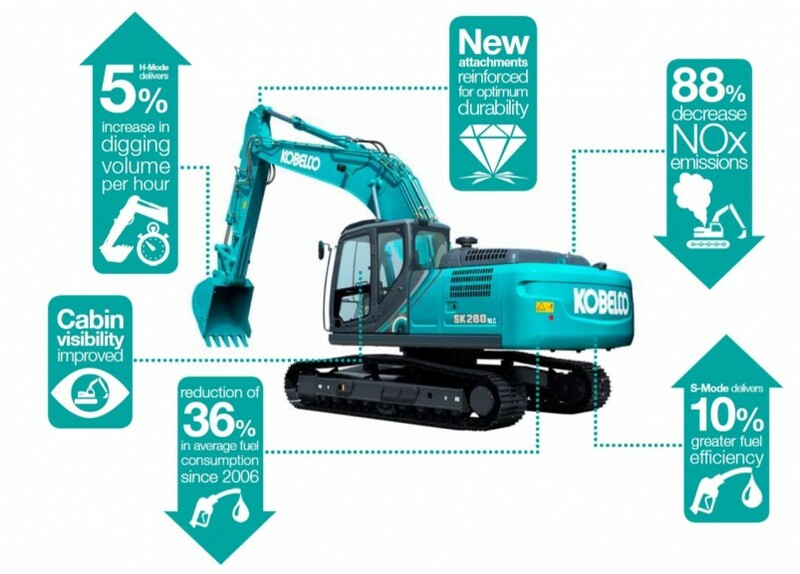 Harmful NOx gases have also been reduced by around 88%, further adding to Kobelco Construction Machinery’s environmental credentials – a fact proudly announced with the display of “Global Environment” decals worn on all new Generation 10 machines. When it comes to durability, Kobelco’s Generation 10 machines are built to withstand the toughest terrain and working conditions. The quality of design and manufacture of the machines not only results in clean and powerful operating performance, but working hours and total working service life of the machine are significantly increased, contributing to greater overall cost efficiency. Generation 10 models feature the latest engineering aspects in boom and arm design for maximum longevity. The new models benefit from revised structural sections, reinforcement points and pin bosses and the attachment point has been reinforced to handle a higher work volume with greater power. In addition, Kobelco’s Arm Interflow System (AIS) is a new hydraulic regenerative system that enables the boom to redistribute hydraulic fluid to the shovel arm during operation. This reduces the need of an external pump and results in less engine/hydraulic workload, therefore contributing to even better cost efficiency. The Generation 10 machines also benefit from several new features that make maintenance and servicing even easier. The layout of the upper deck has been revised and decluttered, and its height has been lowered to provide an increase in overall maintenance space and to enable easy access to the engine and associated service areas. Importantly, from a safety point of view, these improvements also mean that the operator has better all-round visibility. Other features include (on key models), a new compact and easily replaceable canister-type hydraulic oil return filter and a new specification air cleaner inner element, while the fuel tank has been relocated to the left side. In terms of safety, the operator can now access machine diagnostics via the multi-display cabin monitor assist, and the washer tank has been re-located inside the cabin, ensuring work continuity. With operator comfort in mind, the Generation 10 FOPS II and ROPS-compliant safety cabins include control levers with a lighter-feel, a new ‘lock’ lever, control lever box and revised rear storage tray. Additional air conditioning vents are optimised for improved operator comfort and provide greater comfort in hot climates. The new radio is also USB, AUX and Bluetooth-enabled, increasing operator comfort over long hours of work. Generation 10 machines SK210LC-10/SK210NLC-10 and SK260LC-10/SK260NLC-10 are now available from authorised dealers across Europe. The Kobelco SK350NLC-10 will start to arrive in Europe in March.